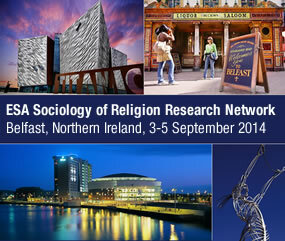 The ESA Research Network Sociology of Religion fosters the sociological study of religion in Europe, bestowing special emphasis on the empirical study of contemporary forms of religion with the purpose of building the interpretive fundament for a theory on European Religion. Over the past decade, religion has regained increased importance on a global level. Despite predictions of secularization, religion has not vanished in the modern world. Though Europe has been widely considered as particular in terms of religion, the revitalization of religion permeating large sectors of the whole society is highly notable in many spheres even in this supposedly secular continent. Although membership rates of established churches continue dropping, religion seems to be vigorously returning on the agenda – both on the level of public appreciation and debate, on the level of several institutional areas and on the level of everyday life. Far from disappearing in “late modern” European societies, religion has gained importance in public, in institutional and in private realms. However, religions is changing its face, undergoing significant transformations and engendering what might be called a new social form of religion. Presently, we witness a rapid intensification of debates on the changed status of religion in European societies. Religion is recognised to play a decisive role in such issues like the integration of migrants in modern societies, the de-traditionalisation of Europe and the foundation of values in “post-secular” societies. The increasing importance of reli­gion in Europe as well as the renewed social scientific and sociological research endeavours within Europe, however, is not mirrored in scientific debates on religion. In fact, until now there is no distinct research association that would allow discussing issues on the situation of religion specifically and exclusively in Europe. This deficiency is particularly surprising, since Europe constitutes an atypical case with respect to religion, following the argument of many scholars and scientific observers of religion. Given the simultaneity of strong secularist movements on the one hand and powerful religious organisations on the other, some scholars even refer to this situation as “European exceptionalism”. More exactly, however, the religious situation within Europe is undeniably highly varied. Its diversity, both between different member countries and within national societies, extends to the point that even well informed observers become easily overwhelmed when tarrying to catch the whole picture. This reason further underpins the urgent need of analyzing the situation of religion in Europe by European experts, i.e. sociologists of religion. The new network contributes to a truly European discussion on the state of religion in Europe. It wants to provide a forum to the various cooperative research endeavours on the European level. It does want to do so not only on the background of the knowledge on the social situation of religion in the different and numerous Europeans societies, thus accounting for the diversity of religion in Europe. Moreover, given the differences between the national traditions within the sociology of religion (as e.g. Italy has a different state of research than e.g. France or Germany, let alone Spain or Poland), the network wants to take into account the multiple voices of European approaches that acknowledges not only the different sociological traditions in the European societies. This seems particularly important because of both the immense variety of the religious situation in the different European countries as well as the plurality of discourses of the sociology of religion in the various European languages. RN34 got its start at the 2011 annual meeting of the European Sociological Association, held in Geneva. To read the original description and call for papers for the network, click here. RN34 will continue to meet at the ESA annual meeting as well as hold its own bi-annual conferences, the first of which is scheduled for 6-8 September 2012 in Potsdam.